Edu Castro’s team imposed themselves on their hosts but didn’t have it all their own way until the second half. 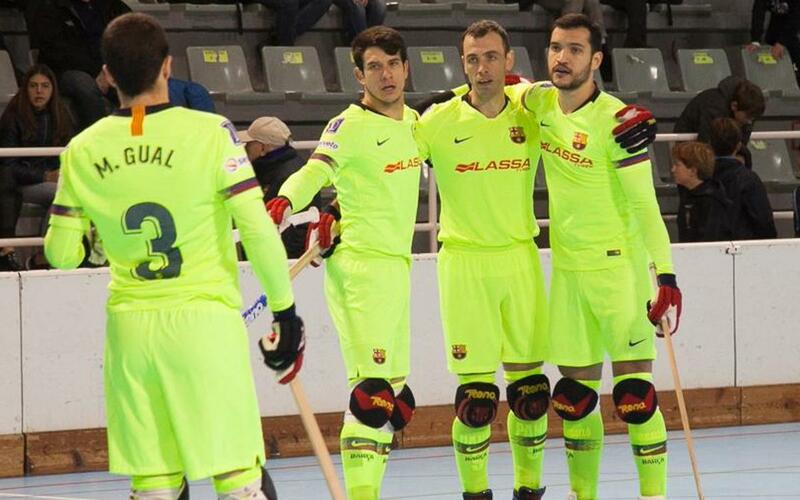 Goals from Matias Pascual, Pablo Alvarez (3), Marc Gual and Sergi Panadero gave Barça their second consecutive victory in the domestic competition. With this result the culés remain at the top of the OK Liga table with 28 points. In the first minutes of the match, the team enjoyed some good chances but the hosts’ defence were rock solid. Persistence from the visitors was rewarded when, in the 15th minute, Matias Pascual made it 0-1, but in the final minutes of the first half, the Blaugrana missed the chance to add another. After the break, the intensity was astonishing from Barça and Pablo Álvarez scored their second (min 27) with an opportunistic shot inside the area. However, the home side responded quickly and Roc Llisa (min 30) brought it back to 1-2. That only succeeded in giving Barça even more energy and rhythm, with Marc Gual, Sergi Panadero and Pablo Álvarez, twice, taking the visitors out of sight by the final whistle. Barça Lassa’s next match will be played at Oliveriense next Saturday at 6.30pm CET, corresponding to the group stage of the European League. PAS Alcoy: Marc Grau, Deri Mataix, Roc Llisa, Carlos Pérez and Joao Ramalho –starters - Simone Romano, Dominguez, Renato Cordeiro and Manuel Monje. Barça Lassa: Egurrola, Marc Gual, Pablo Alvarez, Bargalló and Sergi Panadero –starters - Sergio Fernandez, Matías Pascual, Nil Roca, Ignacio Alabart and Joao Rodrigues. Goals: 0-1, Matias Pascual (min.15); 0-2, Pablo Alvarez (min.27); 1-2, Roc Llisa (min.30); 1-3 Marc Gual (min.31); 1-4, Sergi Panadero (min.48); 1-5, Pablo Alvarez (min.49); 1-6, Pablo Alvarez (min.50). Officials: Daniel Pico and Angel Tavera.